Welcome to the Namibia itineraries page! A short Namibia safari concentrating on the iconic landscape. Kulala Desert Lodge is the most economical option of the Wilderness Safaris properties in the Sossusvlei area. With 14 rooms and great views over the dunes, the lodge is larger than the other options Wilderness have in Sossusvlei but the value on offer is undeniable considering the overall quality of Wilderness safaris operations. Doro Nawas Camp is located in the heart of Damaraland, approximately an hours drive from Damaraland Camp itself. The lodge is much larger than any of the other lodges in the area and subsequently loses that sense of authenticity that we believe this area deserves. Ongava Game lodge is the largest of Wilderness Safaris lodges in Etosha and ultimately are least favourite. As much as we appreciate the quality of the operational side of this lodge we don’t see the point of spending the same amount here as at Ongava Tented Lodge but getting what we believe is a far less quality experience. A classic Namibia safari covering some of the most iconic scenery and game viewing in the country. Run by the local community, Damaraland Camp is a pioneering eco-tourism camp that has won numerous awards for its approach to sustainable tourism. 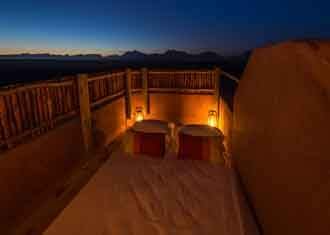 We regard the camp as the best place to see desert elephant, and subsequently one of the regions best properties. A top Namibia safari focusing on the iconic landscape of the country. 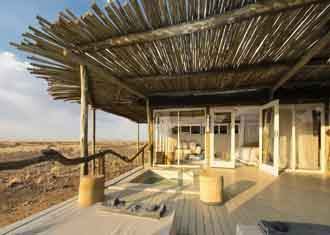 Desert Rhino Camp is located in the private Palmwag Concession in the heart of Damaraland. The reserve is home to the highest concentration of wildlife outside Namibia’s Etosha National Park and most importantly the largest free roaming black rhino population in Africa. Hoanib Skeleton Coast Camp is scenically located in a broad valley at the confluence of two tributaries of the Hoanib River in the northern part of the private Palmwag Concession. A top end Namibia safari, focusing on the iconic landscape and the desert adapted wildlife. Little Kulala is Wilderness Safaris flagship lodge in Sossusvlei. Located only 45 minutes drive from the Sossusvlei Dunes themselves, Little Kulala has the best location of all the dune camps and is unquestionably the most luxurious of all the camps in Sossusvlei. Located on the Magical Kunene River in the far North of the country we would go so far as to say that Serra Cafema is not just one of Namibia’s finest camps but is one of the very best camps in the whole of Africa - the scenery here is absolutely out of this world. Little Ongava takes Etosha accommodations to a completely different level. With only three rooms and the efficient organisation of Wilderness safaris, service here is as personal as it get. Little Ongava has the areas most impressive views and is the finest accommodation in Etosha. Ongava Tented Camp is a charming small tented camp in a private reserve owned by Wilderness Safaris just outside Etosha. There are only eight rooms here, all of which look over a small watering hole that attracts game throughout the day and night.